When you hear the distinctive voice of this shorebird, you'll understand how the laughing gull gets its name--it sounds exactly as if it's laughing. Many a fisherman, after a couple of unsuccessful hours on the fishing pier, has wondered if the mocking laughter of this bird is meant for him. 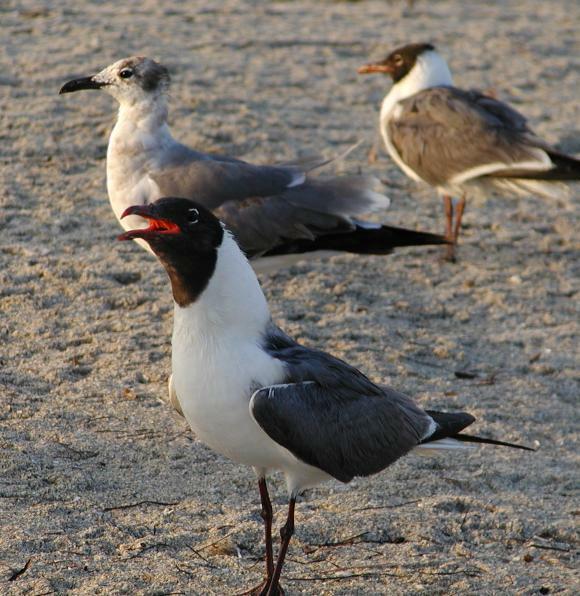 The Laughing Gull, or black-headed gull, is extremely common in the park. The adult bird is in the foreground, and immediately behind the adult is an immature bird. In the summer, the breeding adult's head is black, and the bill is dark red. In winter, the adult's head is mottled gray with black bill and legs. Webbed feet makes the laughing gull a good swimmer, but it doesn't dive underwater very often. It has long, narrow wings, and it often soars over the beach looking for food. Beach picnics, fishermen, and ferry boats are great sources of handouts or discarded food, and the laughing gull is always nearby, either walking impatiently on the beach or following the wake of a trawler.